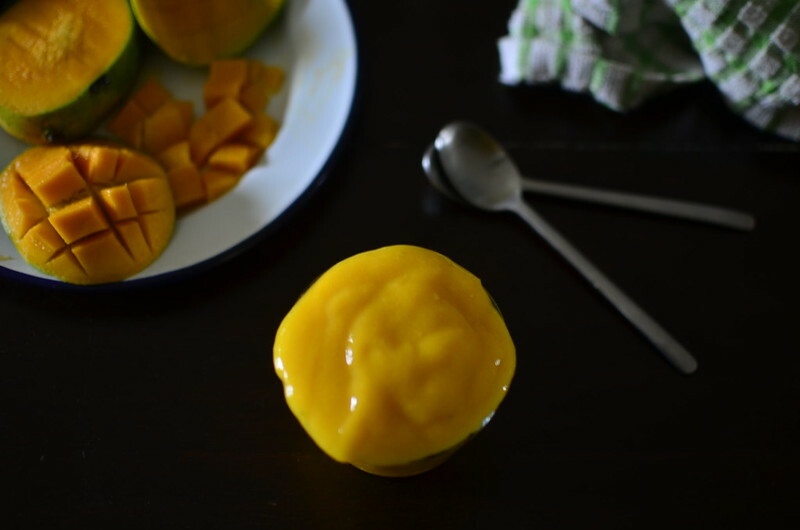 This is something you want, need, must have in your freezer this season when mangoes are on every street corner and fruit stand. Mango puree for the win, because this is quick and easy and can be used in a myriad of ways – drinks, desserts, sauces and on and on. And all in 4 steps. For this, I suggest just-ripe or ripe mangoes – I prefer the Enugu/ Ogbomosho mangoes even though they are fibrous. I find the flavour of the Sheri mango too strong, even though it isn’t as fibrous. Step 1: Remove the flesh from the mangoes, by slicing off the cheeks. Cut up in a grid and remove chunks or scrape through the cheeks with a spoon. Cut/ scrape the rest of the flesh off the stone. Step 2: Put flesh in a blender and puree. You have options open – add a touch of freshly squeezed lime juice or a dash of water. I prefer lime juice to water because the flavours work well together and there isn’t a dilution of the blossomy flavour of the mango puree. Step 3: Pass puree through a sieve to remove bits and fibre, using a spatula to help. Step 4: Preserve by refrigerating for a day or two, and freezing for up to 3 months. Use in custards, drinks, sauces, desserts and the like. Everyone should have a secret stash of this.